A birth chart is a diagram that represents the positions of the planets at the moment that a person was born. It is the central tool for the practice of natal astrology, which holds that information about a person’s life can be determined by examining the positions of the planets at the precise moment of their birth. There are different types of birth charts as well as different styles, depending on which astrological tradition or approach is being used. For example, western birth charts often look different and contain different information when compared to Indian birth charts. On the other hand, the format of birth charts in northern India differs from the chart styles used in southern India. 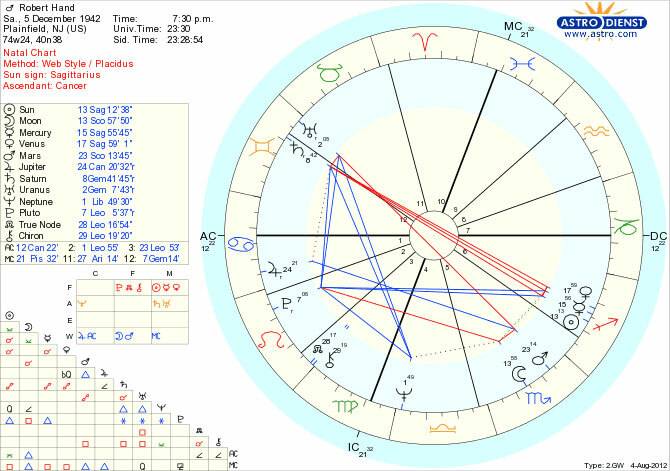 To the right you can see an example of a typical modern western birth chart, which was created through the popular astrological chart calculation service www.astro.com. The chart displays the planets, the topical zodiac, Placidus houses, and the aspects. If you click the image you will see the full chart, which also contains an aspectarian, a list of the precise positions of the planets in the zodiac, as well as the native’s birth data. These are generally typical components of a birth chart, although different astrologers will either add or remove certain factors depending on their approach to astrology. 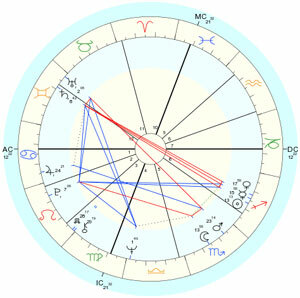 “Natal chart” is a common synonym for birth chart. Less common are the terms “geniture” and “nativity”, which were used frequently in older astrological texts, although not as much in modern times. “Chart” is a common shorthand for “birth chart”, although the term “chart” can be used to any type of astrological chart, and it is not restricted to birth charts in particular.